Teysa’s new hairstyle and dress sense in this set (and also the new art for her Guildpact card, which is in the Orzhov guild kit) remind me a little of Talia al Ghul from the Batman comics. I suppose they are both immortal, amoral schemers, so it makes sense! All of Teysa’s previous cards have been stronger than they looked, and this newest version continues that trend. Her lord effect for creature tokens adds up surprisingly fast, as even the Orzhov’s spirit tokens tend to come in flocks and it becomes downright terrifying when you synergize it with cards like Roar of the Wurm and Dragon Roost. Her first ability is obviously intended largely to interact with the afterlife keyword, but it also got me searching for other death triggers from sets where R&D had fewer self-imposed restrictions on their creativity. I mean, when Grave Pact is one of the less scary things she interacts with, we’re on to something good. 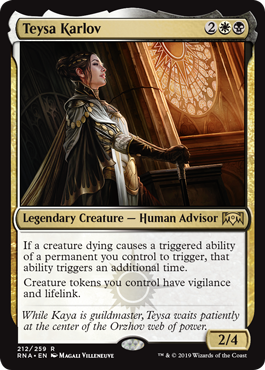 Teysa is one of the Ravnica characters who is part of the “perfect attendance” squad; she’s received a card in all three blocks set on our favorite city-plane, a feat matched by only Niv-Mizzet and Rakdos. This iteration of Teysa is very much a synergistic card meant to play well with the Orzhov mechanic for this set, afterlife, which gives you 1/1 Spirits when the creature dies. If Teysa is out, the afterlife creature dying gives you double the number of tokens you’d normally get…and this is to say nothing of the likes of Vindictive Vampire or Blood Artist and their effects triggering off of those deaths. She also gives those Spirit tokens (and other tokens) vigilance and lifelink. This is relevant! In addition to all the Soldier tokens we oft see running around, Spirits are very nice to give lifelink to. Lifelink can sometimes have a lot of hidden power, adding up to a lot of incremental life gain over a short period. Teysa is powerful, even if her body is underwhelming at first. The question will be if the Orzhov Spirits deck will be a thing for the nonce, as Goblin Chainwhirler is still a menace, and 1/1 Spirits do not generally like Chainwhirlers. I feel like her prospects will depend a lot on if Chainwhirler is still an omnipresent force in Standard.